This generation of parents is overwhelmed with parenting advice; Carla Naumburg sets out to remind them that they have everything they need to raise healthy, happy children. Mindful parenting is about paying attention to what is going on with your children and yourself without judging it or freaking out about it or thinking everyone, including yourself and your child, should be doing something differently. 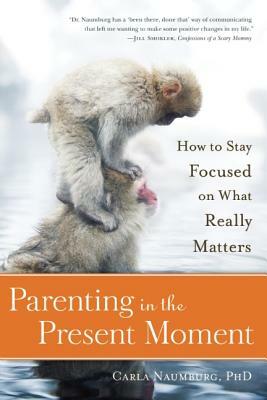 In Parenting in the Present Moment, Naumburg shares what truly matters in parenting—connecting with children in ways that are meaningful to them and you, staying grounded amidst the craziness of parenting, and staying present for whatever life throws your way. With reassuring, compassionate storytelling, she weaves the most current theories—about healthy relationships, compassionate self-care, and mindfulness—throughout vignettes of her own chaotic childhood and parental struggles. She shows how mindfulness creates a solid foundation for any style of parenting, regardless of your cultural background, socio-economic status, or family structure. She also introduces the STAY model for tough times: Stop whatever it is you’re doing; Take a Breath; Attune to you thoughts and those of your child; and Yield to what is happening so you can respond from a place of connection and compassion. Carla Naumburg is a clinical social worker, writer, and most importantly, a mother. She is the mindful parenting blogger for PsychCentral.com and a contributing editor at Kveller.com. Carla's writing has been featured in The New York Times, The Huffington Post, and Parents.com, as well as in a number of academic articles and online magazines. Carla holds a B.A. from Middlebury College, an M.S.W. from Smith College School for Social Work, a PhD from Simmons College School of Social Work, and she has an advanced certificate in mindfulness and psychotherapy. Carla grew up in Santa Fe, New Mexico, and the Bay Area of northern California, and she currently lives outside of Boston with her husband and two young daughters.